Even when veterinary organizations do acknowledge pain, they may still get it wrong. For example, the mission statement of the American College of Veterinary Anesthesiologists (ACVA) says that the organization “believes that animal pain and suffering are clinically important conditions that adversely affect an animal’s quality of life, either in the short or long term. Furthermore, the ACVA endorses a philosophy that promotes prevention and alleviation of animal pain and suffering as an important and tenable therapeutic goal. Clinically, unrelieved pain does not provide any benefit in animals; therefore, veterinarians should strive to manage pain in animals under their care. The ACVA acknowledges that complete elimination of pain in individual animals may not be obtainable or desirable.” (Emphasis added.) And those last two words continue to echo the old attitude that leaving pets in pain is somehow beneficial. While the concept of pain management is slowly spreading among veterinary practitioners, it’s certainly not universal. There are still only 70 certified pain specialists in the U.S. Dr. Michael Petty, DVM, president of the International Veterinary Academy of Pain Management (IVAPM), said in an interview with Tufts University, “I have to believe that over 95 percent of animals in pain are not getting proper treatment… Age is never the sole reason an animal stops doing something. “Old dogs like to play, go for car rides and eat,” says Petty. “They just do things a little bit more slowly because they have decreased muscle mass. They don’t have the energy of youth, but they still like to do all those things.” If pets are not interested in daily activities, like eating, playing, or grooming, or have more “accidents” in the house, there’s a very good chance that it’s due to pain. A survey of veterinarians published in 2000 found that 30% of veterinarians used no pain meds at all for declaw surgery, one of the most painful procedures performed on animals. Of the others, the majority (70%) used primarily butorphanol, a drug known to be largely ineffective in cats; in other words, not much better than nothing. (2) Pain management has a long way to go before it becomes the routine of practicing veterinarians. There have been several “Grimace Scales” developed to analyze facial expressions as signs of pain. There are Grimace Scales for rats, mice, rabbits, horses, and humans; but none so far for cats or dogs. These signs include: turned-back ears, pulled-back whiskers, wrinkled nose, cheek bulging, and squinty eyes. The Mouse Grimace Scale. 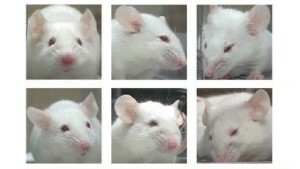 Mice on the left show no pain; middle, moderate pain; and right, severe pain. Other signs of physical pain in cats can be subtle and even contradictory. For example, a cat may over-groom a painful area, such as a joint; or she may stop grooming altogether because she just doesn’t feel good enough to undertake a bath. A painful cat may be less active and sleep more, or be extra restless because she can’t get comfortable. She may be extra clingy and need more attention; or become withdrawn and irritable, even to the point of growling, hissing, swatting or biting when you try to pet her or pick her up. A change in litter box habits may indicate that something’s wrong with either the urinary or digestive system. Hiding is another sign of discomfort, pain, or distress. Most older cats have some degree of arthritis. We may think this is just “slowing down” due to age, but stiffness and reluctance to move are not normal, regardless of the cat’s age. It’s a good idea to start your cat on Omega-3s, glucosamine, and antioxidants by age 10, if not sooner; these supplements may be able to delay the onset of age-related degeneration. In other words, any significant behavior change can signal a problem, and should be evaluated by your veterinarian. It’s up to you to carefully observe your pet and, if you believe you’re seeing signs of pain, discuss it with your veterinarian and insist on treatment. Many vets will give your pet a trial treatment of pain medication, and you can observe whether or not your pet’s behavior changes when the pain goes away. Because there are so few analgesic (pain-relieving) medications that are safe for cats long-term, this is an area where alternative treatments shine. Homeopathy, acupuncture, herbs, and many forms of energetic or hands-on therapies can all reduce inflammation and relieve pain when used appropriately. Check the directory at the American Holistic Veterinary Medical Association to find a practitioner in your area or one who will work with you and your primary care veterinarian by phone. (1) Riera CE, Huising MO, Follett P, et al. TRPV1 Pain receptors regulate longevity and metabolism by neuropeptide signaling. Cell. 2014;57(5):1023-1036. (2) Wagner AE, Hellyer PW. Survey of anesthesia techniques and concerns in private veterinary practice. J Am Vet Med Assoc. 2000 Dec 1;217(11):1652-1657. (3) Wiese AJ, Muir WW 3rd, Wittum TE. Characteristics of pain and response to analgesic treatment in dogs and cats examined at a veterinary teaching hospital emergency service. J Am Vet Med Assoc. 2005 Jun 15;226(12):2004-9. (4) Riera, et al. Op cit.